Customised application for tracking and evaluation of productivity of workers. Daily Productivity Tracking Application manages attendance and productivity of workers in a warehouse. We developed it for a client who has a large distribution warehouse with hundreds of both internal and external employees. The application has a number of modules for monitoring of various aspects of warehouse productivity. It is easy-to-read, interactive and linked to the client’s database systems. For less automated warehouses the warehousing costs are essentialy linked to the productivity of workers. Our client aksed for an attendance and productivity tracking system that would take into account both the company’s core staff and external employees. The client’s requirement was not only to monitor the productivity of the warehouse but also to continuously evaluate it for each section of his warehouse. He wanted the application to include comparison charts that can be easily printed and presented. Over the years, additional modules were added to the application. The service section of the application contains a module for entering employee attendance data and data about manipulated units in the warehouse. All sensitive employee data is protected by a multi-level lock and by delegation of user rights. A built-in calendar checks that the data input is complete for every day. The basic function of the application is to monitor the number of manipulated units per man hour. The results are sorted by days and months. The app tracks inbound and outbound movements, both for the entire warehouse and for individual sections. The productivity tracking module is interactive. Users can the information they need with just one click. 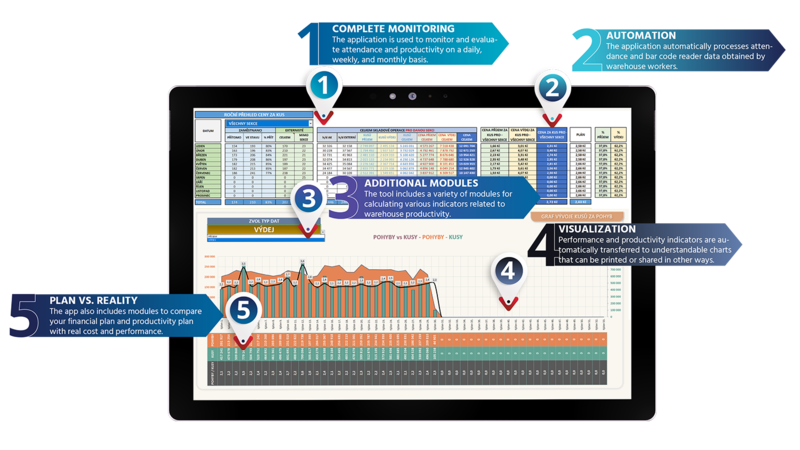 A chart module is used to visualize attendance and productivity data and present results to warehouse managers, section managers and also to employees. The module is interactive. It is possible to choose a monitored period of time and also to select more parameters for each chart. The individual graphs show: 1) total productivity day by day, 2) hours worked, 3) numbers and ratios of present vs. inactive employees, 4) percentage of external employees by agencies, 5) productivity by sections, 6) staff number requirement vs. the actual staff number, 7) the ratio of inbound and outbound moves for each section. There is also an interactive chart for visualisation of warehouse productivity. The user can choose which sections of the warehouse should be included in his calculation of productivity indicators. This allows the user to exclude from the calculation for example a section with a specific agenda that is not involved in the handling of goods in the warehouse. All graphs are easily transferable to presentations and can also be printed. It is possible to use them as a basis for further communication with section managers. The charts may be also posted on the notice boards at workplace. Other modules in the application track the costs of the manipulated goods in and out and compare the real cost with the planned cost for each section. Given the shortage of workers on the market during recent years, it is also essential to compare the number of workers needed with the number of workers available during specific periods of time. The development of Daily Productivity Tracking Application took place over several years. Over time, we have not only responded to requests for new features, but also to the current state of the client’s database systems. 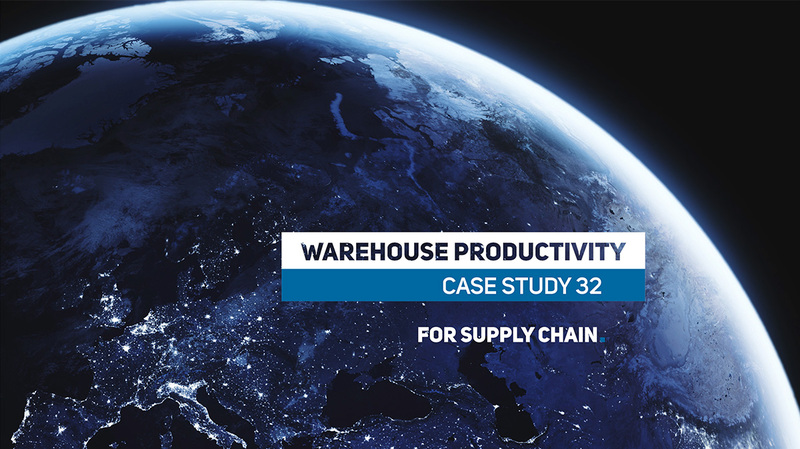 While at the beginning of the application a designated employee had to input attendance data and movements of goods in specific warehouses manually, later we managed to automate the process and connect the application with data from warehouse scanners. We have lots of experience with analysis and development of solutions for warehouses. We can name for example Warehouse Summary, Supply Management Tool or Automated Calculation of Employee Commissions.